Kevin Krumenauer is a Cleveland, Ohio based composer that strives to put the performer first. Through each project he seeks out new ways to make every piece as workable and accessible as possible. His works have been performed in Paris, Capetown, South Africa, Atlanta, and Cleveland. The performance of his latest work Psalm 98, marked his first collaborative effort with fellow artists as part of Connect: A Multimedia Party at the Cleveland Public Theatre. Kevin Krumenauer’s music studies began in his hometown of Atlanta where he attended Georgia State University studying composition with Susan Tepping and trombone with Richard Brady. Mr. Krumenauer moved to Cleveland in 2000, studying composition with Margaret Brouwer at the Cleveland Institute of Music. In the summer of 2002 he was invited to study composition at La Schola Cantorum in Paris, France where he studied with Michel Merlet of the Paris Conservatory. In addition he has studied privately with David Maslanka, who in turn has become a significant influence on his development as a composer. As a composer, Mr. Krumenauer has composed actively for wind band, orchestral, and chamber music. He has had works performed by chamber groups from numerous symphonies including the Charlotte and West Virginia Symphonies and has had wind band music commissioned by the wind ensembles and orchestras of Illinois State University, The University of Alabama at Huntsville, Kent State University, and Case Western Reserve University as well as high schools in Illinois and Wisconsin. His works have been performed both regionally, nationally, and internationally. Mr. Krumenauer is recorded on Albany Records and his music is available at www.kevinkrumenauer.com. 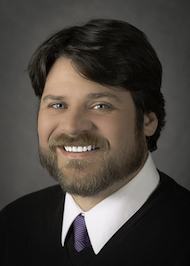 An active educator, Mr. Krumenauer serves on the staff of the Cleveland Institute of Music and is a lecturer at Case Western Reserve University. In addition he sits on the Alumni Board of the Cleveland Institute of Music as well as the board of the Cleveland Arts Project. Mr. Krumenauer resides in Cleveland, Ohio. He is a member of ASCAP and Phi Mu, Music Honors Fraternity. Kevin Krumenauer’s music studies began in his hometown of Atlanta where he attended Georgia State University studying composition with Susan Tepping and bass trombone with Richard Brady. Krumenauer moved to Cleveland in 2000, studying composition with Margaret Brouwer at the Cleveland Institute of Music. In the summer of 2002 he was invited to study composition at La Schola Cantorum in Paris, France. Since receiving his Masters in Music Composition from the Cleveland Institute of Music Mr. Krumenauer has made Cleveland his home and is currently exploring collaborative efforts with fellow artists and providing resources to engaging and innovative artists. His works have been performed in Paris, Capetown, South Africa, Atlanta, and Cleveland. He has had works performed in Severance Hall by chamber groups from the Cleveland Orchestra Youth Orchestra. His work Ecclesiastical Visions was performed by the University of Cape Town in Cape Town, South Africa and his violin Sonata Many-colored Roads was premiered at La Schola Cantorum in Paris. The performance of his latest work Psalm 98, marked his first collaborative effort with fellow artists as part of Connect: A Multimedia Party at the Cleveland Public Theatre. He serves on the Alumni Board of the Cleveland Institute of Music and is on faculty at Lakeland Community College. He lives in Cleveland, Ohio. Kevin Krumenauer is a member of ASCAP. Lives of Great Composers: Beethoven, Verdi, Mozart, etc.